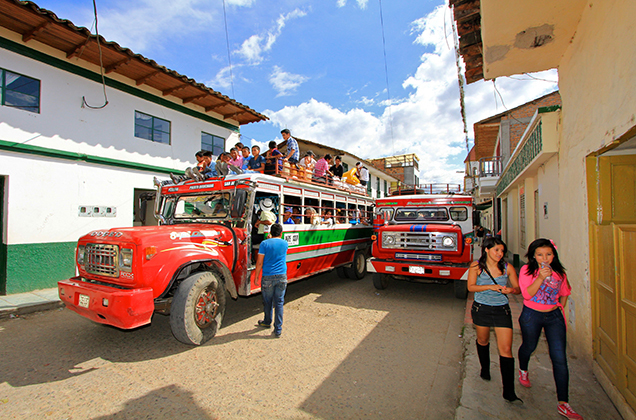 Despite constant scaremongering in the media, Colombia is a country that is officially well and truly open for tourism. It is a destination that sums up South America’s natural wonders, with varied and surprising landscapes and towns and villages draped in colonial architecture, tranquil coffee plantations, mysterious archaeological sites and Cartagena’s sublime, sophisticated beach life. – The Caribbean coastline stretches for 1,600km, with an impressive variety of landscapes – you’ll find Guarija desert rubbing shoulders with mountain, tropical jungle, pristine beach and coral island. – In the Andes three mountain ranges crisscross the country from north to south, where your journey will take you to the Western Central and Eastern Cordillera, with volcanoes and glaciers (up to 5000m) and into eje de cafetero, the heart of the coffee region. – The Pacific rainforest is alive with mangroves, pristine beaches and a surprising biodiversity. From June to September whales gather to put on a very impressive show. – The Amazon and the Llanos, the vast Orinoco plains, are shared equally with neighbouring Venezuela. Colombia is second only to Brazil when it comes to richness in plant and animal species, boasting no less than 10% of global biodiversity. The Colombian government has decided to protect this unique biodiversity through the creation of 38 national nature parks. Our particular favourites are the Sierra Nevada Park, home to the highest mountain coastline in the world, the Tayrona Park, the Rosario Islands in the Caribbean and Los Nevados Park in the Cordillera Central. – Colonial British cities steeped in myth include Bogota (especially when you visit La Candelaria district and the Gold Museum), Villa de Leyva, Mompos and, of course, Cartagena, the gleaming jewel in the country’s crown. – Retrace the footsteps of pre-Columbian civilization in the profound and mysterious Lost City, and Tayrona, Tierradentro and San Agustin in the south are worth a visit. The melting pot that makes up the Colombian people brings a great wealth of cultural diversity, which manifests itself in music, dance, crafts and cooking. They are warm, passionate people who find it easy to welcome visitors.